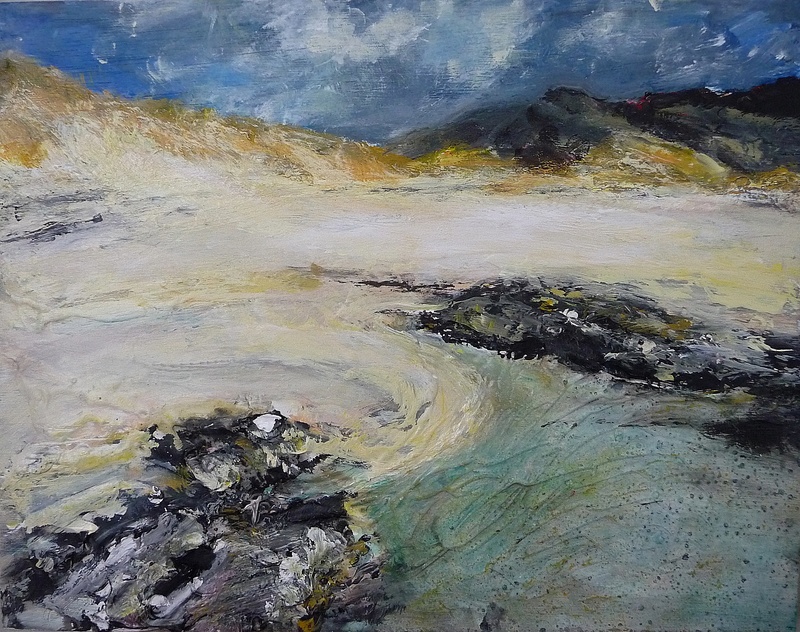 Today’s paintings of the wonderful Sanna Bay in Ardnamurchan. I’m quite happy with the water effect in Sanna Bay (shallow water) which doesn’t really show up in a photo – a bit of underlying texture and colour then a shallow glaze of turquoise with varnish. The painting directly above ‘painted itself’ as they say – always a good thing as it feels like I’m getting into the flow of this series of Ardnamurchan. The exhibition of these paintings will be at the Resipole Gallery – a three person exhibition which launches on the 17th May. I’m going to take a trip up there for the opening, also for more painting. This entry was posted in Uncategorized and tagged rose strang artworks, Sanna bay painting, scottish landscape art, scottish landscape artists, sea paintings, west coast of scotland paintings on April 11, 2019 by rosestrang.